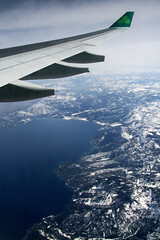 Just five days after snowboarding in Homewood, Lake Tahoe, I flew home to Dublin on a flight that flew right over the resort. By chance I had my camera at the ready and snapped this quick shot. If you view this shot on flickr and rollover the image, you’ll see where the resort is. Not a bad shot either, but the fact I was snowboarding here a few days earlier makes this a pretty special photo for me. While on this trip, I also realised how much I love snowboarding. It’s been 7 years since I last had the chance, but I’m going to make it my mission to get on the slopes at least once a year from now on. *Edit* A recently Discovery Channel news article sent to me by Ian Stanley, points to some long term damage being done to Lake Tahoe by global warming. See here – Lake Tahoe Threatened by Warming?